TRPV1 is a nonselective cation channel that may be activated by a wide variety of exogenous and endogenous physical and chemical stimuli. The best-known activators of TRPV1 are: temperature greater than 43 °C (109 °F); acidic conditions; capsaicin, the irritating compound in hot chili peppers; and allyl isothiocyanate, the pungent compound in mustard and wasabi. The activation of TRPV1 leads to a painful, burning sensation. Its endogenous activators include: low pH (acidic conditions), the endocannabinoid anandamide, N-oleyl-dopamine, and N-arachidonoyl-dopamine. TRPV1 receptors are found mainly in the nociceptive neurons of the peripheral nervous system, but they have also been described in many other tissues, including the central nervous system. TRPV1 is involved in the transmission and modulation of pain (nociception), as well as the integration of diverse painful stimuli. The sensitivity of TRPV1 to noxious stimuli, such as high temperatures, is not static. Upon tissue damage and the consequent inflammation, a number of inflammatory mediators, such as various prostaglandins and bradykinin, are released. These agents increase the sensitivity of nociceptors to noxious stimuli. This manifests as an increased sensitivity to painful stimuli (hyperalgesia) or pain sensation in response to non-painful stimuli (allodynia). Most sensitizing pro-inflammatory agents activate the phospholipase C pathway. Phosphorylation of TRPV1 by protein kinase C have been shown to play a role in sensitization of TRPV1. The cleavage of PIP2 by PLC-beta can result in disinhibiton of TRPV1 and, as a consequence, contribute to the sensitivity of TRPV1 to noxious stimuli. Agonists such as capsaicin and resiniferatoxin activate TRPV1 and, upon prolonged application, cause TRPV1 activity to decrease (desensitization), leading to alleviation of pain via the subsequent decrease in the TRPV1 mediated release of inflammatory molecules following exposures to noxious stimuli. Agonists can be applied locally to the painful area in various forms, generally as a patch or an ointment. Numerous capsaicin-containing creams are available over the counter, containing low concentrations of capsaicin (0.025 - 0.075%). It is debated whether these preparations actually lead to TRPV1 desensitization; it is possible that they act via counter-irritation. Novel preparations containing higher capsaicin concentration (up to 10%) are under clinical trials. 8% capsaicin patches have recently become available for clinical use, with supporting evidence demonstrating that a 30-minute treatment can provide up to 3 months analgesia by causing regression of TRPV1-containing neurons in the skin. Currently, these treatments must be re-administered on a regular (albeit infrequent) schedule in order to maintain their analgesic effects. Resolvin E1 (RvE1), RvD2 (see resolvins), neuroprotectin D1 (NPD1), and maresin 1 (Mar1) are metabolites of the omega 3 fatty acids, eicosapentaenoic acid (for RvE1) or docosahexaenoic acid (for RvD2, NPD1, and Mar1). These metabolites are members of the specialized proresolving mediators (SPMs) class of metabolites that function to resolve diverse inflammatory reactions and diseases in animal models and, it its proposed, humans. These SPMs also dampen pain perception arising from various inflammation-based causes in animal models. The mechanism behind their pain-dampening effects involves the inhibition of TRPV1, probably (in at least certain cases) by an indirect effect wherein they activate other receptors located on the neruons or nearby microglia or astrocytes. CMKLR1, GPR32, FPR2, and NMDA receptors have been proposed to be the receptors through which these SPMs operate to down-regulate TRPV1 and thereby pain perception. N-Oleyl-dopamine, another endogenous agonist, binds bind to human VR1 with an Ki of 36 Nm. AM404—an active metabolite of paracetamol—that serves as an anandamide reuptake inhibitor and COX inhibitor also serves as a potent TRPV1 agonist. The plant-biosynthesized cannabinoid cannabidiol also shows "either direct or indirect activation" of TRPV1 receptors. ↑ "Drugs that physically interact with Transient receptor potential cation channel subfamily V member 1 view/edit references on wikidata". 1 2 3 Caterina MJ, Schumacher MA, Tominaga M, Rosen TA, Levine JD, Julius D (October 1997). 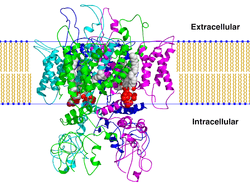 "The capsaicin receptor: a heat-activated ion channel in the pain pathway". Nature. 389 (6653): 816–24. doi:10.1038/39807. PMID 9349813. ↑ Xue Q, Yu Y, Trilk SL, Jong BE, Schumacher MA (August 2001). "The genomic organization of the gene encoding the vanilloid receptor: evidence for multiple splice variants". Genomics. 76 (1-3): 14–20. doi:10.1006/geno.2001.6582. PMID 11549313. ↑ Everaerts W, Gees M, Alpizar YA, Farre R, Leten C, Apetrei A, Dewachter I, van Leuven F, Vennekens R, De Ridder D, Nilius B, Voets T, Talavera K (February 2011). "The capsaicin receptor TRPV1 is a crucial mediator of the noxious effects of mustard oil". Curr. Biol. 21 (4): 316–21. doi:10.1016/j.cub.2011.01.031. PMID 21315593. ↑ Cui M, Honore P, Zhong C, Gauvin D, Mikusa J, Hernandez G, Chandran P, Gomtsyan A, Brown B, Bayburt EK, Marsh K, Bianchi B, McDonald H, Niforatos W, Neelands TR, Moreland RB, Decker MW, Lee CH, Sullivan JP, Faltynek CR (2006). "TRPV1 receptors in the CNS play a key role in broad-spectrum analgesia of TRPV1 antagonists". J. Neurosci. 26 (37): 9385–93. doi:10.1523/JNEUROSCI.1246-06.2006. PMID 16971522. 1 2 Huang SM, Bisogno T, Trevisani M, Al-Hayani A, De Petrocellis L, Fezza F, Tognetto M, Petros TJ, Krey JF, Chu CJ, Miller JD, Davies SN, Geppetti P, Walker JM, Di Marzo V (June 2002). "An endogenous capsaicin-like substance with high potency at recombinant and native vanilloid VR1 receptors". Proc. Natl. Acad. Sci. U.S.A. 99 (12): 8400–5. doi:10.1073/pnas.122196999. PMC 123079 . PMID 12060783. ↑ Khairatkar-Joshi N, Szallasi A (2009). "TRPV1 antagonists: the challenges for therapeutic targeting". Trends Mol Med. 15 (1): 14–22. doi:10.1016/j.molmed.2008.11.004. PMID 19097938. ↑ Jhaveri MD, Elmes SJ, Kendall DA, Chapman V (2005). "Inhibition of peripheral vanilloid TRPV1 receptors reduces noxious heat-evoked responses of dorsal horn neurons in naïve, carrageenan-inflamed and neuropathic rats". Eur. J. Neurosci. 22 (2): 361–70. doi:10.1111/j.1460-9568.2005.04227.x. PMID 16045489. ↑ Story GM, Crus-Orengo L (2008). "Feel the Burn". American Scientist. 95 (4): 326–333. doi:10.1511/2007.66.326. ISSN 0003-0996. Archived from the original on January 19, 2008. ↑ Gunthorpe MJ, Szallasi A (2008). "Peripheral TRPV1 receptors as targets for drug development: new molecules and mechanisms". Curr. Pharm. Des. 14 (1): 32–41. doi:10.2174/138161208783330754. PMID 18220816. 1 2 Gavva NR, Bannon AW, Surapaneni S, Hovland DN, Lehto SG, Gore A, Juan T, Deng H, Han B, Klionsky L, Kuang R, Le A, Tamir R, Wang J, Youngblood B, Zhu D, Norman MH, Magal E, Treanor JJ, Louis JC (March 2007). "The vanilloid receptor TRPV1 is tonically activated in vivo and involved in body temperature regulation". J. Neurosci. 27 (13): 3366–74. doi:10.1523/JNEUROSCI.4833-06.2007. PMID 17392452. ↑ Steiner AA, Turek VF, Almeida MC, Burmeister JJ, Oliveira DL, Roberts JL, Bannon AW, Norman MH, Louis JC, Treanor JJ, Gavva NR, Romanovsky AA (July 2007). "Nonthermal activation of transient receptor potential vanilloid-1 channels in abdominal viscera tonically inhibits autonomic cold-defense effectors". J. Neurosci. 27 (28): 7459–68. doi:10.1523/JNEUROSCI.1483-07.2007. PMID 17626206. ↑ Gavva NR (2008). "Body-temperature maintenance as the predominant function of the vanilloid receptor TRPV1". Trends Pharmacol. Sci. 29 (11): 550–7. doi:10.1016/j.tips.2008.08.003. PMID 18805596. ↑ Gavva NR, Treanor JJ, Garami A, Fang L, Surapaneni S, Akrami A, Alvarez F, Bak A, Darling M, Gore A, Jang GR, Kesslak JP, Ni L, Norman MH, Palluconi G, Rose MJ, Salfi M, Tan E, Romanovsky AA, Banfield C, Davar G (May 2008). "Pharmacological blockade of the vanilloid receptor TRPV1 elicits marked hyperthermia in humans". Pain. 136 (1-2): 202–10. doi:10.1016/j.pain.2008.01.024. PMID 18337008. ↑ Chizh BA, O'Donnell MB, Napolitano A, Wang J, Brooke AC, Aylott MC, Bullman JN, Gray EJ, Lai RY, Williams PM, Appleby JM (November 2007). "The effects of the TRPV1 antagonist SB-705498 on TRPV1 receptor-mediated activity and inflammatory hyperalgesia in humans". Pain. 132 (1-2): 132–41. doi:10.1016/j.pain.2007.06.006. PMID 17659837. ↑ Pareek TK, Keller J, Kesavapany S, Agarwal N, Kuner R, Pant HC, Iadarola MJ, Brady RO, Kulkarni AB (January 2007). "Cyclin-dependent kinase 5 modulates nociceptive signaling through direct phosphorylation of transient receptor potential vanilloid 1". Proc. Natl. Acad. Sci. U.S.A. 104 (2): 660–5. doi:10.1073/pnas.0609916104. PMC 1752192 . PMID 17194758. ↑ Knotkova H, Pappagallo M, Szallasi A (2008). "Capsaicin (TRPV1 Agonist) therapy for pain relief: farewell or revival?". Clin J Pain. 24 (2): 142–54. doi:10.1097/AJP.0b013e318158ed9e. PMID 18209521. ↑ 8% Capsaicin patches. "Qutenza prescribing information" (PDF). Retrieved 23 November 2011. 1 2 De Petrocellis L, Schiano Moriello A, Imperatore R, Cristino L, Starowicz K, Di Marzo V (December 2012). "A re-evaluation of 9-HODE activity at TRPV1 channels in comparison with anandamide: enantioselectivity and effects at other TRP channels and in sensory neurons". British Journal of Pharmacology. 167 (8): 1643–51. doi:10.1111/j.1476-5381.2012.02122.x. PMC 3525867 . PMID 22861649. 1 2 Patwardhan AM, Scotland PE, Akopian AN, Hargreaves KM (November 2009). "Activation of TRPV1 in the spinal cord by oxidized linoleic acid metabolites contributes to inflammatory hyperalgesia". Proceedings of the National Academy of Sciences of the United States of America. 106 (44): 18820–4. doi:10.1073/pnas.0905415106. PMC 2764734 . PMID 19843694. ↑ Patwardhan AM, Akopian AN, Ruparel NB, Diogenes A, Weintraub ST, Uhlson C, Murphy RC, Hargreaves KM (May 2010). "Heat generates oxidized linoleic acid metabolites that activate TRPV1 and produce pain in rodents". The Journal of Clinical Investigation. 120 (5): 1617–26. doi:10.1172/JCI41678. PMC 2860941 . PMID 20424317. ↑ Sisignano M, Angioni C, Ferreiros N, Schuh CD, Suo J, Schreiber Y, Dawes JM, Antunes-Martins A, Bennett DL, McMahon SB, Geisslinger G, Scholich K (2013). "Synthesis of lipid mediators during UVB-induced inflammatory hyperalgesia in rats and mice". PloS One. 8 (12): e81228. doi:10.1371/journal.pone.0081228. PMC 3857181 . PMID 24349046. ↑ Mabalirajan U, Rehman R, Ahmad T, Kumar S, Singh S, Leishangthem GD, Aich J, Kumar M, Khanna K, Singh VP, Dinda AK, Biswal S, Agrawal A, Ghosh B (2013). "Linoleic acid metabolite drives severe asthma by causing airway epithelial injury". Scientific Reports. 3: 1349. doi:10.1038/srep01349. PMC 3583002 . PMID 23443229. ↑ Wen H, Östman J, Bubb KJ, Panayiotou C, Priestley JV, Baker MD, Ahluwalia A (April 2012). "20-Hydroxyeicosatetraenoic acid (20-HETE) is a novel activator of transient receptor potential vanilloid 1 (TRPV1) channel". The Journal of Biological Chemistry. 287 (17): 13868–76. doi:10.1074/jbc.M111.334896. PMC 3340178 . PMID 22389490. ↑ Gregus AM, Doolen S, Dumlao DS, Buczynski MW, Takasusuki T, Fitzsimmons BL, Hua XY, Taylor BK, Dennis EA, Yaksh TL (April 2012). "Spinal 12-lipoxygenase-derived hepoxilin A3 contributes to inflammatory hyperalgesia via activation of TRPV1 and TRPA1 receptors". Proceedings of the National Academy of Sciences of the United States of America. 109 (17): 6721–6. doi:10.1073/pnas.1110460109. PMC 3340022 . PMID 22493235. ↑ Gregus AM, Dumlao DS, Wei SC, Norris PC, Catella LC, Meyerstein FG, Buczynski MW, Steinauer JJ, Fitzsimmons BL, Yaksh TL, Dennis EA (May 2013). "Systematic analysis of rat 12/15-lipoxygenase enzymes reveals critical role for spinal eLOX3 hepoxilin synthase activity in inflammatory hyperalgesia". FASEB Journal. 27 (5): 1939–49. doi:10.1096/fj.12-217414. PMC 3633813 . PMID 23382512. ↑ Pace-Asciak CR (April 2015). "Pathophysiology of the hepoxilins". Biochimica et Biophysica Acta. 1851 (4): 383–96. doi:10.1016/j.bbalip.2014.09.007. PMID 25240838. ↑ Qu Q, Xuan W, Fan GH (2015). "Roles of resolvins in the resolution of acute inflammation". Cell Biology International. 39 (1): 3–22. doi:10.1002/cbin.10345. PMID 25052386. ↑ Serhan CN, Chiang N, Dalli J, Levy BD (2015). "Lipid mediators in the resolution of inflammation". Cold Spring Harbor Perspectives in Biology. 7 (2): a016311. doi:10.1101/cshperspect.a016311. PMID 25359497. ↑ Lim JY, Park CK, Hwang SW (2015). "Biological Roles of Resolvins and Related Substances in the Resolution of Pain". BioMed Research International. 2015: 830930. doi:10.1155/2015/830930. PMC 4538417 . PMID 26339646. ↑ Ji RR, Xu ZZ, Strichartz G, Serhan CN (2011). "Emerging roles of resolvins in the resolution of inflammation and pain". Trends in Neurosciences. 34 (11): 599–609. doi:10.1016/j.tins.2011.08.005. PMC 3200462 . PMID 21963090. ↑ Serhan CN, Chiang N, Dalli J (2015). "The resolution code of acute inflammation: Novel pro-resolving lipid mediators in resolution". Seminars in Immunology. 27 (3): 200–15. doi:10.1016/j.smim.2015.03.004. PMC 4515371 . PMID 25857211. ↑ Ross RA (November 2003). "Anandamide and vanilloid TRPV1 receptors". Br. J. Pharmacol. 140 (5): 790–801. doi:10.1038/sj.bjp.0705467. PMC 1574087 . PMID 14517174. ↑ Högestätt ED, Jönsson BA, Ermund A, Andersson DA, Björk H, Alexander JP, Cravatt BF, Basbaum AI, Zygmunt PM (September 2005). "Conversion of acetaminophen to the bioactive N-acylphenolamine AM404 via fatty acid amide hydrolase-dependent arachidonic acid conjugation in the nervous system". J. Biol. Chem. 280 (36): 31405–12. doi:10.1074/jbc.M501489200. PMID 15987694. ↑ Ligresti A, Moriello AS, Starowicz K, Matias I, Pisanti S, De Petrocellis L, Laezza C, Portella G, Bifulco M, Di Marzo V (September 2006). "Antitumor activity of plant cannabinoids with emphasis on the effect of cannabidiol on human breast carcinoma". J. Pharmacol. Exp. Ther. 318 (3): 1375–87. doi:10.1124/jpet.106.105247. PMID 16728591. ↑ Starowicz K, Cristino L, Di Marzo V (2008). "TRPV1 receptors in the central nervous system: potential for previously unforeseen therapeutic applications". Curr. Pharm. Des. 14 (1): 42–54. doi:10.2174/138161208783330790. PMID 18220817. 1 2 Gibson HE, Edwards JG, Page RS, Van Hook MJ, Kauer JA (2008). "TRPV1 channels mediate long-term depression at synapses on hippocampal interneurons". Neuron. 57 (5): 746–59. doi:10.1016/j.neuron.2007.12.027. PMC 2698707 . PMID 18341994. ↑ Peters JH, McDougall SJ, Fawley JA, Smith SM, Andresen MC (2010). "Primary afferent activation of thermosensitive TRPV1 triggers asynchronous glutamate release at central neurons". Neuron. 65 (5): 657–69. doi:10.1016/j.neuron.2010.02.017. PMC 2837850 . PMID 20223201. ↑ Numazaki M, Tominaga T, Takeuchi K, Murayama N, Toyooka H, Tominaga M (2003). "Structural determinant of TRPV1 desensitization interacts with calmodulin". Proc. Natl. Acad. Sci. U.S.A. 100 (13): 8002–6. doi:10.1073/pnas.1337252100. PMC 164702 . PMID 12808128. 1 2 Morenilla-Palao C, Planells-Cases R, García-Sanz N, Ferrer-Montiel A (2004). "Regulated exocytosis contributes to protein kinase C potentiation of vanilloid receptor activity". J. Biol. Chem. 279 (24): 25665–72. doi:10.1074/jbc.M311515200. PMID 15066994. ↑ Heyman I, Rang HP (May 1985). "Depolarizing responses to capsaicin in a subpopulation of rat dorsal root ganglion cells". Neurosci. Lett. 56 (1): 69–75. doi:10.1016/0304-3940(85)90442-2. PMID 4011050. Geppetti P, Trevisani M (2004). "Activation and sensitisation of the vanilloid receptor: role in gastrointestinal inflammation and function". Br. J. Pharmacol. 141 (8): 1313–20. doi:10.1038/sj.bjp.0705768. PMC 1574908 . PMID 15051629. Pingle SC, Matta JA, Ahern GP (2007). "Capsaicin receptor: TRPV1 a promiscuous TRP channel". Handb Exp Pharmacol. 179 (179): 155–71. doi:10.1007/978-3-540-34891-7_9. PMID 17217056. Liddle RA (2007). "The role of Transient Receptor Potential Vanilloid 1 (TRPV1) channels in pancreatitis". Biochim. Biophys. Acta. 1772 (8): 869–78. doi:10.1016/j.bbadis.2007.02.012. PMC 1995747 . PMID 17428642.